The Master of the View of Saint Gudula was active in Brussels in the last quarter of the 15th century. His name derives from a panel in the Musée du Louvre whose background includes a depiction of the façade of the church of Sainte-Gudule in Brussels. Clothing the naked was one of the Seven Acts of Mercy as set out in the Gospel of Saint Matthew in verses on the Last Judgement. In the centre, the painter depicts a man who carries out the words of Christ, assisted by two youths. Christ himself appears among the group of poor people on the right, distinguishable by his delicate halo and by the Dove of the Holy Spirit resting on his shoulder. The composition includes elements characteristic of the work of this anonymous painter, such as his interest in architectural backgrounds, used to create a greater sense of pictorial depth, and the expressivity of the figures, which at times borders on caricature. Friedländer was the first art historian to study and establish the artistic personality of this anonymous master active in Brussels in the last quarter of the 15th century. His name derives from a panel in the Musée du Louvre in which the background of the principal scene is the façade of the church of Sainte Gudule in Brussels. The Paris panel forms the reference point for the attribution of other religious compositions to this artist as well as a portrait in the National Gallery, London. 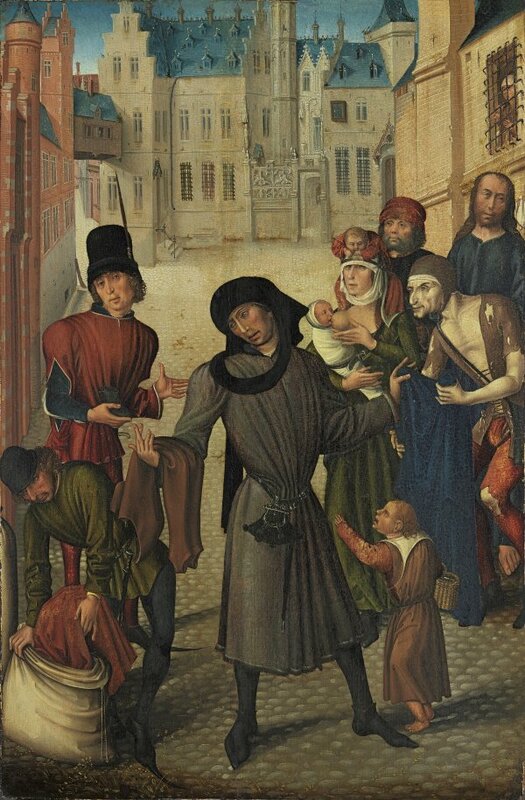 Clothing the Naked, one of the Seven Acts of Mercy, was attributed by Friedländer to the Master of the View of Saint Gudule at the time that the author wrote his commentary to the catalogue of the sale of the Albert figdor collection, to which the present panel had belonged. It was auctioned with this attribution by the Paul Cassirer gallery in Berlin and entered the Thyssen-Bornemisza collection in 1931. The Acts of Mercy are set down in the Gospel of Saint Matthew (25, 35–37) in one of the chapters on the Last Judgement, although only six of the seven acts are recorded: the seventh was added by the theologian Jean Beleth. The Master of the View of Saint Gudula depicts one of the acts in the foreground; that of clothing the naked. In the centre a man assisted by two young men on the left hands out clothes to a group of poor people located in the middle-ground. This group, which adheres to the description in the Gospel, includes the figure of Christ, identifiable through his halo and through the dove of the Holy Spirit on his left shoulder. The painting thus represents verse 40 of Matthew’s text: “Verily I say unto you, inasmuch as ye have done it unto one of the least of these my brethren, ye have done it unto me”. The background takes the form of a city view, possibly a town square to judge from its size. The present panel has all the characteristics of this anonymous master’s style such as the interest in architectural backgrounds used to expand the sense of pictorial depth in the narratives; the expressive character of the figures which borders at times on caricature, for example, the ragged figure in front of Christ or the position of the baby on top of its mother’s head while she breastfeeds another one. The way of depicting the hands is also distinctive, with their fine, long fingers and widely separated thumb, evident, for example, in one of the figures on the left handing out clothes. The unusual shape of the heads, which are wide and rather flattened, covered with caps or headdresses reaching almost down to the eyebrows, is another feature of this artist’s work. The Musée Cluny, Paris, has another panel from this group, depicting another Act of Mercy, that of visiting prisoners. A complete cycle of the Seven Acts of Mercy by the Master of Alkmaar, dated 1504, is in the Rijksmuseum, Amsterdam.